The city of Seattle has removed a large, unauthorized homeless encampment near the famed Fremont Troll sculpture that was the site of several drug overdoses this year. City officials have also pledged to prevent the encampment from reforming, according to an email to a Fremont resident from Deputy Mayor David Moseley obtained by The Seattle Times. Seattle regularly cleans up and removes homeless encampments, only for people to return within a matter of days or hours. Officials and community members have long debated the effectiveness of the strategy, particularly because of the limited availability of housing and desirable shelter beds. The cleanup of the site began Monday and was completed Thursday. The camp sprawled over a large area, with tents covering medians at North 38th Street and Aurora Avenue North and an embankment that slopes down to the street level below the Aurora Bridge, just east of the troll. Following the cleanup, many paper signs were posted on trees throughout the area, citing two city codes: one noting a written permit is required to make use of a public space; and another warning that people could be arrested for interfering with city employees or police officers working at the site. 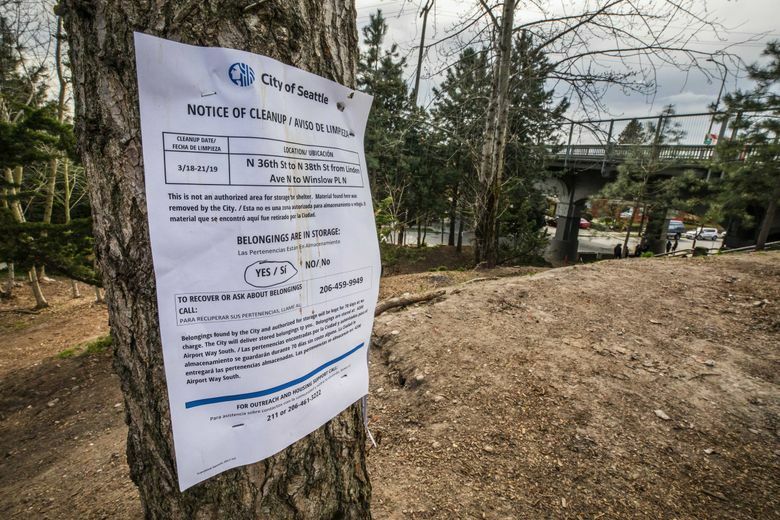 Mark Prentice, spokesman for Mayor Jenny Durkan, said in an email Friday that current city protocol for dealing with encampments allows the city to monitor recently-cleaned areas to ensure new camps don’t replace them. The city has taken similar steps with other large encampments in the past, like the cleanup of a site in the Myers Way greenbelt last fall, said Will Lemke, spokesman for the Navigation Team, a collection of police officers and outreach workers who help connect people in the camps to resources and facilitate cleanups. On the morning of Jan. 17, 911 dispatchers received a call about a drug overdose in the camp at North 38th and Aurora. Then came another call and another. In all, seven overdoses were reported between 10 a.m. and 1 p.m., five at the encampment. Two were reported a few blocks away, in the 3800 block of Stone Way, said Kristin Tinsley, spokeswoman for the Seattle Fire Department. At least one of the victims was inside an apartment complex, said James Apa, spokesman for Public Health – Seattle & King County. Ambulances transported six of the patients to hospitals. The person transported from the apartment complex later died: 44-year-old Vincent Nguyen passed away on Jan. 23, Apa said. Nguyen’s exact cause of death is pending. Officials have not been able to explicitly connect the five overdoses in the camp to the others beyond the fact they occurred in such close succession, Apa said, although Public Health remains concerned that the incidents could be linked to a “particularly strong and lethal batch of drugs.” King County saw a sharp rise in fentanyl-related deaths last year compared to 2017. This week, Public Health reported that one of the syringes at the scene contained a very rare and potent form of fentanyl called carfentanil, in addition to heroin. The syringe with carfentanil was not found near Nguyen, Apa said. The Seattle Police Department is still investigating the incidents and no arrests related to the distribution of the drugs have been made, said Seattle police Sgt. Sean Whitcomb. The increasing size of the camp and the overdoses has shaken the community, according to Kaley Bender, a member of the neighborhood group Friends of the Troll’s Knoll. An encampment was removed from the same area in September, but that cleanup wasn’t nearly on the same scale as the camp that was cleared out this week, Lemke said. The city also shares the community’s health and safety concerns, Lemke said. The Navigation Team did outreach at the site 18 times since the fall, persuading a dozen people to accept offers of shelter, though Lemke said some of that occurred during February’s severe snowstorms. There were approximately 60 tents in the camp when this week’s cleanup began, he said. The city must follow specific protocols, called Multi-Department Administrative Rules (MDARs), before a homeless camp can be removed. A camp that is considered an immediate hazard or obstruction can be shut down immediately; the city has increased these kinds of removals in recent months. For other camps, the city must give inhabitants at least 72 hours’ notice and cite at least one of eight justifications for closing a camp. “Criminal activity beyond illegal substance use” was the main reason cited for the troll camp cleanup, Lemke said, though many tents were also to exposed vehicular traffic. 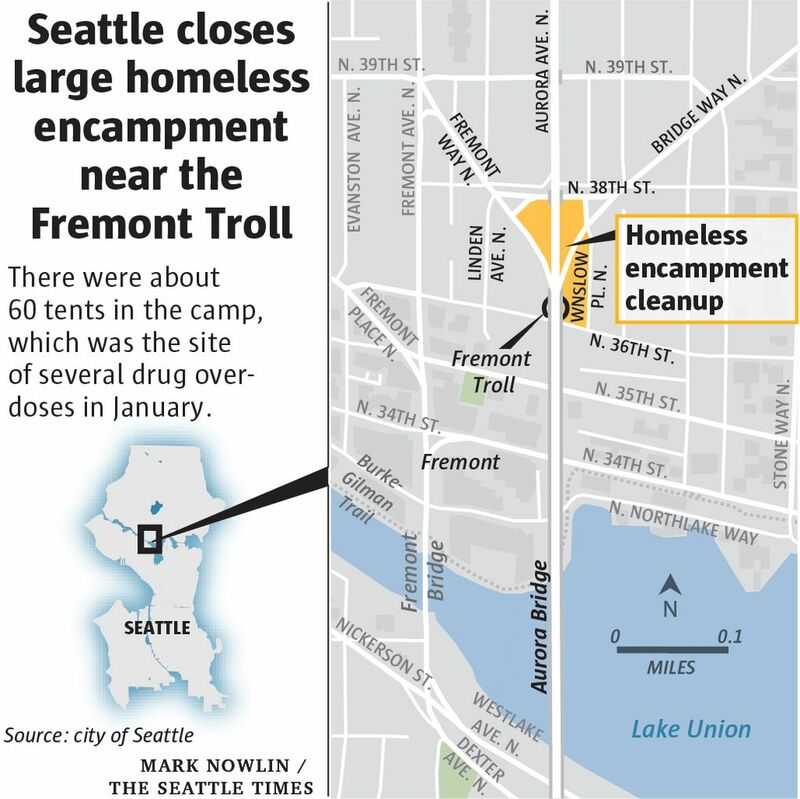 In these 72-hour cleanups, the city must also offer shelter beds to everyone living in the camp, which can be difficult when a camp is as large as the Fremont site. As a result, the city had to offer a combination of city-operated beds and those run by the Union Gospel Mission in order to ensure enough spots were available during the cleanup period. In all, 12 people in the camp accepted shelter this week, Lemke said. Bender said her organization hopes to raise enough money to turn the area east of the troll into a park, to help prevent more encampments from forming. On Friday morning, one day after the cleanup was completed, visitors stopped by to take photos of the troll, the 18-foot-tall structure inspired by the Billy Goats Gruff fairy tale and created as part of an art contest in 1989, meant to rehabilitate the area under the Aurora Bridge, “which was becoming a dumping ground and haven for drug dealers,” according to the Fremont Chamber of Commerce website. On the wooded hill where the encampment once stood, no tents had yet reappeared.